Trump Whines: Jimmy Fallon Really Messed Up My Hair - Joe.My.God. 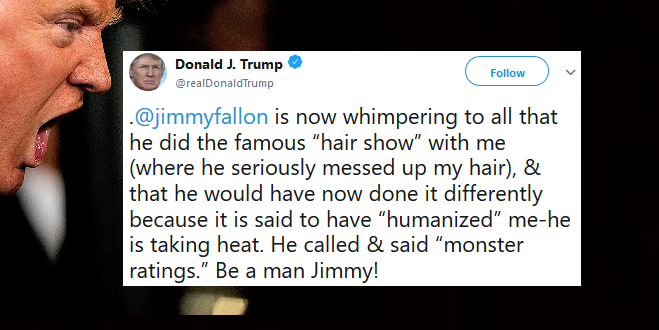 Late-night host Jimmy Fallon should “be a man,” President Donald Trump wrote on Twitter Sunday night, instead of “whimpering” over criticism that stems from the president’s now-infamous 2016 appearance on his show. The dig at Fallon, the host of NBC’s “Tonight Show,” stemmed from an interview the comedian sat for last week with The Hollywood Reporter in which he said he “made a mistake” by engaging in a jovial back-and-forth with Trump during the then-candidate’s September 2016, appearance on his show. The interview famously ended with Fallon tousling Trump’s hair.